I’m sure a lot of you remember the blog that I used to have, the original pages hosted on the HYPA server. It wasn’t really a blog, but more of a mish-mash of my experiments, downloads etc. I often get requests for the downloads, so I do intend to repost them all eventually. I posted the light presets a while back and now I am going to repost the Thinking Particles presets. The first offering is my TP Basic Flocking example. This is a really simple setup that shows you how you can create a flocking or swarming type effect using Thinking Particles. As you can see from the Xpresso, there is not a lot to it. The particles are all in the same default All group. I’ve added a null which is then animated along a spline. This null is used as a Follow Position for the particles. As the particles try to follow the nulls position, there is some hidden geometry that is used as a Deflector, this helps to add a little chaos to the motion. I’ve used the Particle Collision preset to stop the particles colliding with each other too. I hope you find this useful. Don’t forget that you can also clone onto the Thinking Particles using MoGraph if you want to start mixing up some MoGraph and TP techniques. Lots of fun to be had for sure. Thanks again Tim! Fun times. @Alan Hi Alan, Thanks for the comment. I am aware that there are plenty of presets for Thinking Particles, they are definitely useful and worth exploring, even simple setups like the time control preset. However I think it is beneficial for people to understand the basic structure and inner workings of the Xpresso setup which is why I encourage breaking apart these presets and adapting them for your own unique projects. This will give you a deeper understanding of TP and it’s uses in the long run. thank you very much for uploading your presets and sharing your knowledge, especially the scary xpresso- stuff! I’m bit of a newbie with Xpresso, how can I randomize the particles so at the Particle Birth it uses more than one PShape (you know, so the flock has different fishes)? Thanks Tim! Keep it up! thanks for the download, I am a newbie to expresso, how do I substitute, my shape for the Pyramid. @4do drag the object into the PShape node to replace the pyramid. Is there a way to have the particles leave the path at a specific point and “flock” to fill a volume shape? For example, if you had flocking birds and then you wanted them to leave the path and form a tree or something. 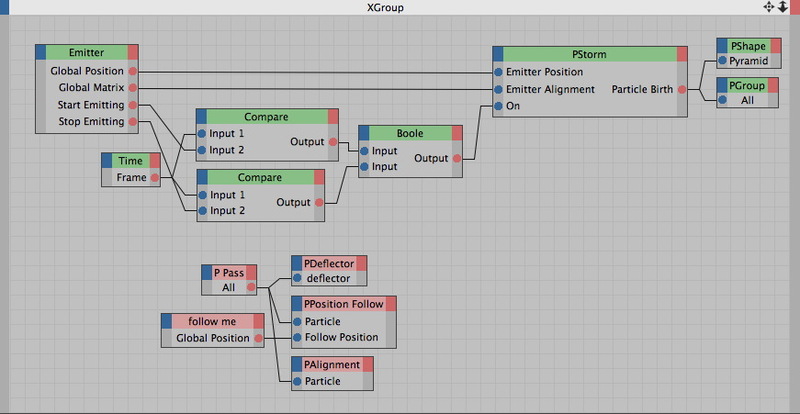 @Craig You’d need to change the particles to a new group and then use the PVolumePosition node to move them into an object. I’m a real greenhorn on Xpresso though… so I wanted to ask you how to make the animation last longer than 250 frames. I’ve replaced the spline, naturally adjusted the amount of frames and adjusted the tag. But the cones disappear after 250 frames… I’ve been staring for a good few hours to the Xpresso patch… but I can’t seem to find it.. Cool tim, nice setup. Do you know if theres a way to add in an effect where the particles won’t pass through each other – so when they get near another particle they’ll move around or away from it? Sorry tim, wasn’t looking at the scene properly, just realised theres a repulse and bounce node in there. Not used that before. I’m having a problem where I have a pre-animated bat and I can replace the pyramid with it just fine but it distorts the geometry and stretches the polys way off screen. I did indeed ‘bake’ and ‘loop’ the bat flying animation but this isn’t doing the trick. @JNothing It depends how you’ve created the geometry. It shouldn’t stretch! Maybe you cloned onto the particles with MoGraph, if so there is an option to stretch the particles on the cloner. Perhaps you have some deformer that is not moving with the geometry so as the object moves it moves through the deformer space. All guesses, but hopefully something to check. Try just cloning onto the Particle Group with MoGraph rather than using the TP Particle Geometry object and the PShape node. Maybe that will solve your problem. Love this setup 🙂 How can I control flocking settings? Mainly I need more speed, but also interested in controlling turbulence etc. Thanks!